30% Off Selected Items at Craghoppers - Easter Offer! It all started in 1965, when the founders planned a climb of Mount Everest and went looking for the best gear possible. What they found didn’t meet their standards, so they researched and designed their own gear and, after a successful trip, Craghoppers was born. Now a world-leading brand in outdoor and adventure clothing, Craghoppers is constantly producing new technologies to make its garments more comfortable, waterproof, insulating and lighter than ever before. Its NosiLife anti-insect tech has really changed the game when it comes to more tropical expeditions, whilst the ThermoElite range provides excellent thermal insulation and Aquadry tech gives a waterproof edge to many garments. With a thriving community of wearers, as well as ambassadors from all corners of the world, Craghoppers has fans from world-leading mountaineers to Duke of Edinburgh participants. With a lively blog full of features and advice on travel, as well as supporting numerous charity projects, the Craghoppers community is one of the most potent and active out there. How do I use my Craghoppers discount code? Sign up to Craghoppers emails and be the first to hear about some amazing deals! Is there a Craghoppers near me? Very probably, check out the store locator here. Can I get a student discount at Craghoppers? You sure can, register here to take advantage of some great student deals. Can I get Craghoppers catalogues delivered to me? Good thinking, yes you can! Get one delivered here. Can deliver to over 5500 stores in the UK for just £3.95. You can return unwanted items within 28 days of receipt. Items must be unused with original labels and packaging, including proof of purchase. Returns acceptable from items bought online or via catalogue. If you are returning goods bought in-store, contact the store directly. Whether you’re planning a weekend in the lake district or 3 months trekking in the Himalayas, you need to make sure you’ve got the right gear for your expedition. 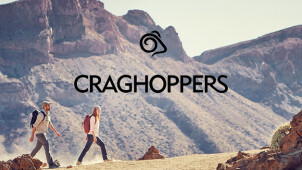 Craghoppers stock an amazing range of outdoor adventure clothing, from insulated jackets to insect-repellant trousers and beyond. A Craghoppers discount code could save you a bundle off your next order, meaning you can set off on your adventure for less than you’d think. Craghoppers have developed NosiLife, a breakthrough range of insect-repellent garments. The unique repellent treatment is woven into the fabric, ensuring your clothes are protected for their lifetime. Avoid the hassle of applying cream or spray every half hour, and enjoy a permanent insect repellent solution with this unique and innovative range. NosiLife products also feature moisture wicking properties to ensure you’re kept cool and dry in the sun. You’re treks will never be the same! The starting point of any expedition is a good rucksack. Essential for carrying the items for your adventure (or, if you’re travelling longer term, for carrying your entire life!) you need a strong and reliable rucksack to keep your stuff secure. A Craghoppers voucher code could save you a packet off your next pack and with a range of sizes and designs to fit a variety of needs, you’re sure to find the rucksack that’s right for you.